Configure shipping zones, shipping rates, and handling fees. Automate shipment calculations with real-time rates, or set up your own rate calculations with flexible rate configuration options. Shipping Groups allow for different customers to see different options. For example, you may have a Shipping Group for large volume customers versus typical customers, and create a separate series of rates to reflect the type of shipping large volume customers would need versus smaller-volume customers. Create or edit a shipping group using the Add button (+) golden-arrow drill-down. Assign the desired shipping group as the Default Shipping Group using the “Change” button. This will apply to any customer who doesn’t have an assigned shipping group. Shipping zones are used to outline where specific rates will apply. For example, the country or state on a customer’s shipping could be used to break down separate shipping options. A common scenario is for out-of-country customers to use different shipping methods compared to in-country customers. Select the desired shipping group from the top drop-down (see marker 1 below). Press the Add “+” button to create a new shipping group, or see Managing Shipping Groups below. Once the shipping group is selected, this group’s zones will be listed (see marker 2 below). 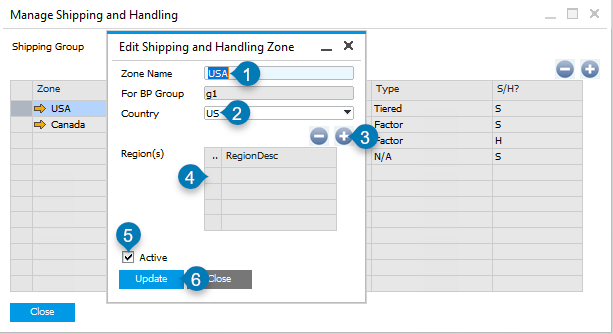 Select/Add a Shipping Group (1); Edit (2) or Add (3) a Zone. Manage the Shipping Zones on the left-most pane. To add a shipping zone for this Shipping Group, press the Add button (+) (marker 3 above). This will open the “edit zone” screen described below. To edit a shipping zone for this Shipping Group, press the golden arrow button (marker 2 above). This will open the “edit zone” screen described below. To delete a shipping zone, select that zone using the left-most column. Ensure there are no Shipping or Handling methods assigned to this zone (see the right-most pane). If there are rates, remove them, otherwise, use the remove button (-) to delete the zone. Admin-friendly zone name (1); Select Country (2); Optionally add regions (3); View regions already included (4); Activate the zone (5); Apply changes (6). Zone Name (marker 1 above): Create an admin-friendly name for the zone. For BP Group: (read-only) Identifies the Shipping Group that this zone applies to. Country (marker 2 above): Select the desired country. Regions: Use the +/- buttons (marker 3 above) to manage regions (states/provinces) that apply to this zone. View any assigned regions (4). To include every region, leave this section blank. Active (marker 5 above): When active, this zone’s configured rates will be applied to orders who fall into this Shipping Zone/Group pair. Real Time Shipping Carriers define which vendors can be used to calculate Real Time Shipping Rate estimates. This information must be configured before Real Time Rates can be set up. To create a new carrier, press the Add button (+). To edit an existing carrier, use the golden-arrow drill-down. Use the + button to add a new carrier, or use the golden-arrow drill-down to edit an existing one. 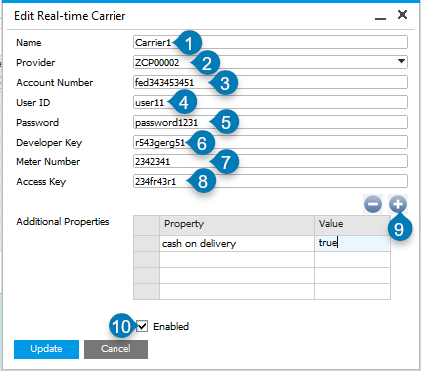 Enter Real-time Carrier details, as described below. Name (1): An admin-friendly name to allow this carrier to be used in rates. Provider (2): Select the desired vendor. Out-of-the-box, support for FedEx, Canada Post, UPS and USPS are provided. Custom options may be implemented, and can be configured using the “Custom” Provider. Account Number (3): As per the carrier account. User ID (4): As per the carrier account. Password (5): As per the carrier account. Developer Key (6): As per the carrier account. Meter Number (7): As per the carrier account. Access Key (8): As per the carrier account. Additional Properties (9): If required by a carrier, Property/Value pairs may be included. These Property/Value pairs will be sent to the carrier as part of the transaction request. Enabled (10): This carrier may only be used when Enabled is checked. Add/Update changes to allow this Carrier to be used in Shipping Rate calculations. Shipping rates are the amounts applied to an order for the given shipping zone and shipping group. The shipping group and shipping zone must be configured first (as described above), then rates can be configured. Select the Shipping Group in the top drop-down (see marker 1 below). See Managing Shipping Groups above if a new Group must be created. Select or add a Shipping Group (1); Select a Zone (2); Add (3) or Edit (4) a Rate. Select the shipping zone from the left-most column of the left-hand pane (see marker 2 above). This identifies where the Rate will be applied. Press the right-most Add button (+) to create a new rate (see marker 3 above), or use the golden-arrow drill-down to edit an existing rate (see marker 4 above). 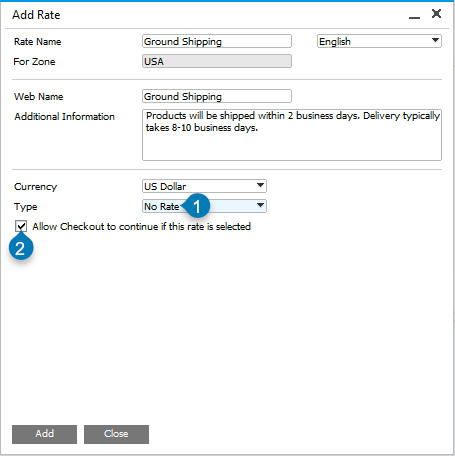 Select the language (1); Create an admin-friendly name (2); Set the customer-facing name (3); Provide the rate details seen by customers (4); Select the currency for this rate (5); Select the Rate Type (6). Configure details for the select Rate Type (marker 6 above). EzRate: This shipping rate type uses Real Time Carriers to calculate the rate that will be applied to an order. Factor: This applies a shipping charge based on either the order’s amount or weight. Handling Factor: This applies a handling charge based on either the order’s amount or weight. Handling Tiered: This applies a handling charge based on an admin-managed list of ranges. No Rate: This can be used to either pass-through the order without applying a shipping rate, or to stop the order from being placed. Tiered: This applies a shipping charge based on an admin-managed list of ranges. Charges can be based on order total or order weight. EzRates are shipping rates which use Real Time Carriers to calculate the rate that will be applied to an order. 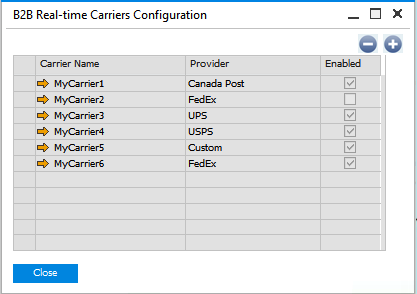 Real Time Carriers must be defined before this option can be configured. Factor rates apply a shipping charge based on either the order’s amount or weight. 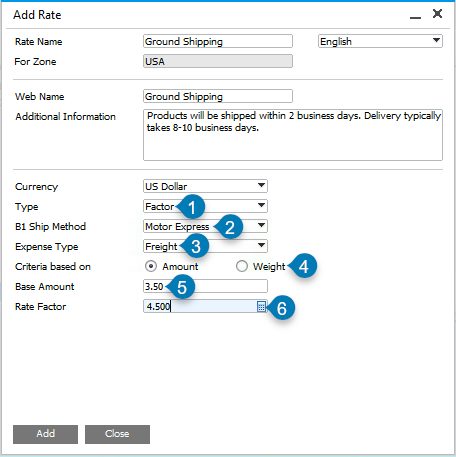 Select Factor (1); Assign a B1 Shipping Method (2); Assign an Expense Type (3); Select rate criteria of order amount or weight (4); Optionally apply a base charge (5); Apply a factor percent (6). B1 Ship Method (marker 2 above): When the order is created, the selected B1 Shipping Method will be assigned to the order. Expense Type (marker 3 above): This shipping rate will be charged as the selected Expense Type (OEXD). Important: Expense Types for any applied rate must be unique. 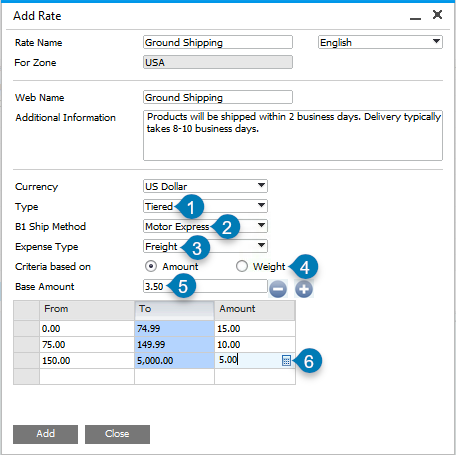 That is, Handling rates must have a different Expense Type than shipping rates, and the Expense Type for each Handling rate must be unique if more than one may be added to the same order. Best practice is to ensure that any Handling rate within a shipping zone has a distinct Expense Type among all other Handling and Shipping rates within the same zone. Criteria based on (marker 4 above): “Amount” indicates that the factor will be applied as a percent against the order total (for example, 4.5%). “Weight” applies an amount per unit of weight (for example, $4.50 per kilogram). Base Amount (marker 5 above): Optionally set the base dollar amount that will be applied to every order using this shipping method. This will be added to the calculated factor amount. Rate Factor (marker 6 above): When based on “Amount”, this is a percent to be applied to the order total (for example, 4.5%). When based on “Weight”, this is a charge per unit of weight (for example, $4.50 per kilogram). Handling Factor rates apply a handling charge based on either the order’s amount or weight. Similar to Shipping Factor Setup, Factor-based Handling rates can be configured. Note that Handling Rates may be optional or mandatory. Optional rates will prompt the customer to add that rate to the order (for example, an optional warranty). 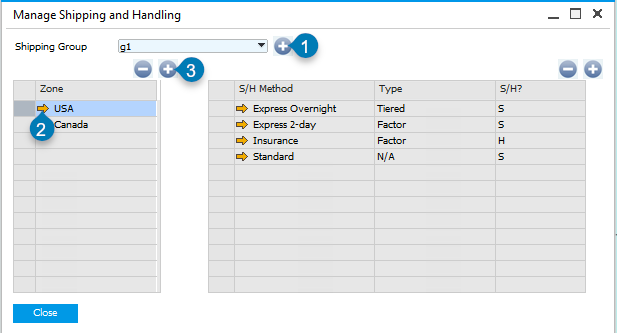 Handling Tiered rates apply a handling charge based on an admin-managed list of ranges. Charges can be configured to allow the customer to “opt in” (for ex. warranties), or can be a mandatory expense applied to all relevant orders (for ex. a region-specific handling fee, such as a ferry surcharge). 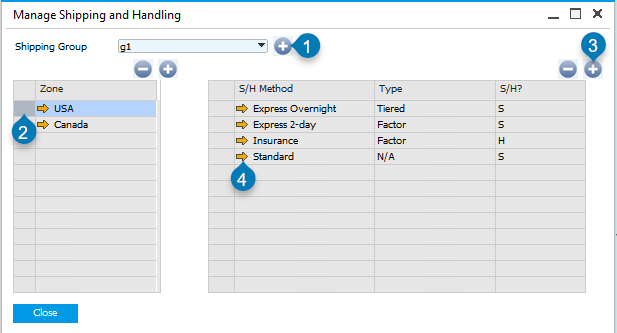 Similar to Shipping Tiered Setup, Tiered Handling rates can be configured. Note that Handling Rates may be optional or mandatory. Optional rates will prompt the customer to add that rate to the order (for example, an optional warranty). This No Rate type can be used to either pass-through the order without applying a shipping rate, or to stop the order from being placed. For Example, this may be used to identify free shipping, or to present the customer with a friendly “sorry, you can’t proceed in this region” message. When a region is not serviced for shipping, prevent checkout. When shipping rates are not known at time of check-out, allow checkout with a notice of a later charge on account. This can be applied to a Shipping Group for customers with good account credit. To allow check-out, place a check-mark in the “Allow Checkout” option (see marker 2 below). Select No Rate (1); Allow customers to check out with this rate (2). 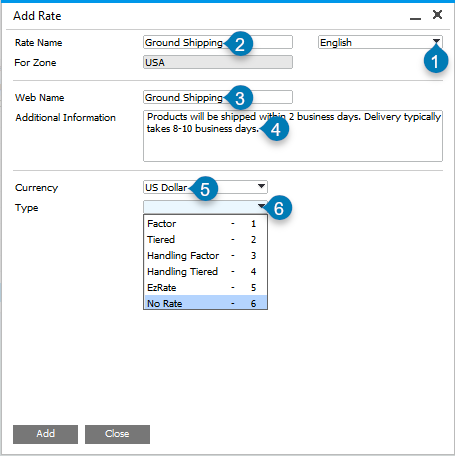 Tiered rates apply a shipping charge based on an admin-managed list of ranges. Select Tiered (1); Assign B1 Ship Method (2); Assign Expense Type (3); Set the Criteria (4); Optionally set a base amount (5); Define Tiered amounts (6) using +/- buttons. Criteria based on (marker 4 above): “Amount” indicates that the rate will be determined based on the order total. “Weight” determines the rate based on the order’s weight. Base Amount (marker 5 above): Optionally set the base dollar amount that will be applied to every order using this shipping method. This will be added to the relevant tiered amount. Tiered Rates (marker 6 above): Use the + button to define a tier for this shipping rate. Tiers must be non-overlapping.